Ranking SEAL commanders recently banned the Navy Jack from SEAL uniforms. 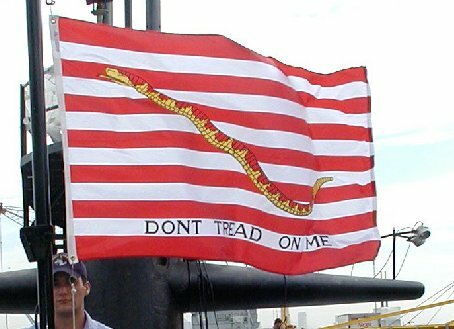 The Navy Jack is the ‘don’t tread on me’ flag, one that has earned a revered place in America’s naval history and a beloved place in sailor’s hearts, through its use for over two centuries. This symbol of America’s naval ferocity has spanned our country’s entire existence, flying from the masts of the Continental Navy during the war of independence, to today’s War on Terror. In fact, an amendment to the Navy code called SECNAV Instruction 10520.6 clearly states that as of 31 May 2002 all ships are to fly the flag throughout the duration of the War on Terror. So why would ranking SEAL commanders ban the historical symbol? Is the proverbial top bass banning the flag? Is President Obama? Clearly the administration and sycophant “top brass” officers have degraded America’s military prestige; from hand-tying rules of engagement, to uniform regulations that make our military allegedly more compatible with foreign forces, to the banning of an awe-inspiring flag that traces its roots to the first U.S. Navy.